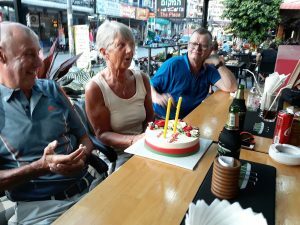 The Pattaya Links Golf Society visited Pleasant Valley on Friday, 8th February to play a stableford competition on the course which was in reasonable condition but with greens which were variable in pace on the back nine. Little wind was evident and conditions were sultry and humid as the field of forty-two golfers teed off on time. The field was buoyed by a dozen “new” golfers, all keen to enjoy a day’s golf with the popular group and they were not to be disappointed. The field was divided into two flights at eighteen and under. Scores were close in both flights and the second division saw US golfer, Tip Briney, post 32 pointsfor fifth place, a couple behind Thai lady golfer Panda Aree in fourth with 34. A level par round by senior golfer Alan Walker nudged him into third place, one behind Wednesday’s winner Len Jones on 37 points. The flight was won by Stuart Kidd with 38 points. The top flight was just as tight with Russell Exley taking fifth place with 37 points, on countback from Phil Davies. Three golfers vied for the other minor places with 38 points, countbacks placing Ray Banks in fourth place behind Tommy Marshall and Masa Takano. Poor Masa, “bridesmaid” again! The flight winner and Green Jacket recipient was Friday Man Tony Browne who followed his previous week’s forty points at Pattavia with another forty points haul this week. The best front nine ( non winners) was reserved for Phil Davies’ 22 points, David De Caminada holding the best back nine award with 27 points, after countback. The “silly hat” was awarded to Maurice Roberts after demonstrating that smoking can be dangerous, whilst the dreaded “wig” went to its first female winner Hilary Stoker after a poor showing on the tough track. Pleasant Valley had seen the PLGS week close with good scores and fine comradeship.